L-R: Kelly Euripidou and Olivia Zorzut. 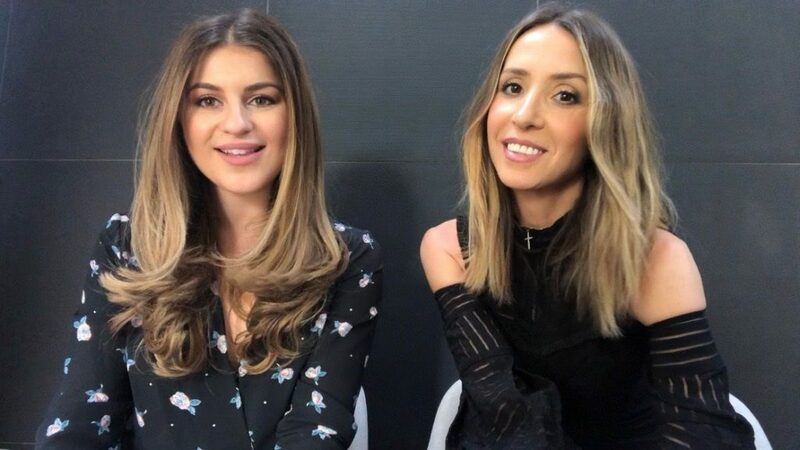 It was roughly four years ago when Greek Australian certified accountant at-the-time, Kelly Euripidou, and her self-employed friend Olivia Zorzut entered the Australian entrepreneurial ecosystem. Their entry point had nothing to do with availability of funds or the hope that this move would bring about a quick buck. It had a lot to do with an idea and the passion of two young women to create something of their own. They wanted to develop a tanning accelerator product and sell it to the world. No ‘great expectations’ there for riches! “It was about having something to do outside of my day job, basically. Something that is mine and having something that it was a bit of a creative outlet,” said Kelly Euripidou, who few weeks ago, deservedly, received ‘The Chris Saristavros Award for Young Achievement’ entering the Hellenic Australian Chamber of Commerce and Industry’s (HACCI) Hall of Fame – an award that recognises the talent of young entrepreneurs of Greek heritage. Their expectations were quite simple… If they managed to make enough money to put a couple of extra holiday trips in their diary, then (hooray! ); success! Well FYI they achieved a lot, lot more. Their idea came to fruition, their product, which they named The Fox Tan, was developed, manufactured, packed and shipped from Australia to the world – or in their case, to the tens of thousands of customers who endorsed their product from every corner of the planet. 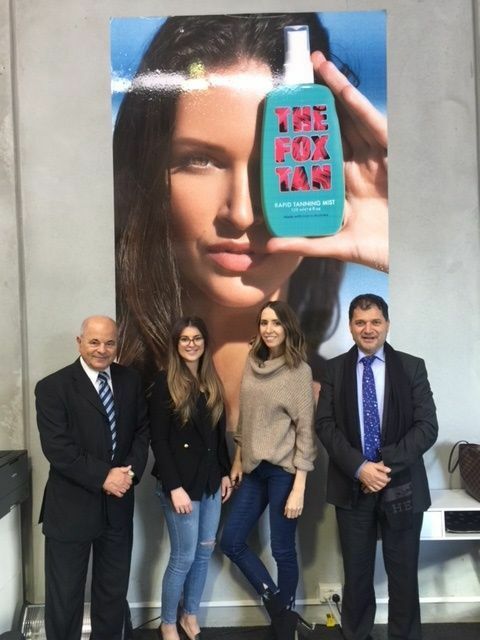 Last year, The Fox Tan also landed on the shelves of UK’s Superdrug cosmetics stores, the largest retailer of cosmetics in UK and is now one of the most popular tanning products in the country. “The only way to do great work is to love what you do,” said Steve Jobs, the founder of Apple, and the story of success for these young women starts with nothing else but love. The daughter of Bank of Sydney’s Oakleigh branch manager George Euripidou, Kelly, started her career following in her dad’s steps. “I finished my VCE, I went to the University, did my accounting degree and started off working into the banking sector,” Kelly said. Five years went by and though her finance sector career managed to fulfil her thirst for creativity and her desire to be challenged initially, it was not before too long she realised that the excitement had dissipated. “I was getting a bit sick of what I was doing. I wanted to move on to something more interesting and to something more diverse, I guess. I started looking for a change. What I was doing was not what I wanted to be doing for ever. I love challenge,” Kelly said. At the same time Olivia had sold her business. She had been in the tanning industry for eight years and had her own tanning beauty salon but, like Kelly, she felt that she had run her course with it and was looking for something different. “I just felt that I had achieved my goals there. I am obsessed with business, I was since I was a kid. Basically my Barbie dolls had to have their own business. I love my independence,” Olivia said. That’s how these two women came together and decided the ‘who’ of their startup. It was now time to decide the ‘what’ and to learn from scratch the ‘how’. They were talking about clothing, maybe a beauty product or even jewellery. “I went to the beach one day thinking there has to be a faster and smarter way to do this. This is when I came up with the idea; then I run it past Kelly. She loved it and we basically started the very next day. We spoke to our biochemist to ask him if this product could be made. He loved the sound of it, and he hadn’t done it like that before and that is how we started. By developing the product,” Olivia said. L-R: George Euripidou, father of Kelly and manager of the Oakleigh, Bank of Sydney branch, Kelly, Olivia and Miltos Michaelas, CEO of Bank of Sydney. As if the challenge of starting a business was not enough, Kelly and Olivia decided to develop a product that treads into dangerous waters and could potentially be open to a lot of scrutiny and bad publicity in Australia or elsewhere due to the negative effects of sun exposure. Even sunscreens with UV protection have received their fare share of criticism from time to time. “We believe in our product and we advise everyone who uses it to do it in conjunction with UV protection. Believing in your product is the basis of it all,” Olivia said. The manufacturing of the product has started and is currently manufactured in Australia. The garage of the Euripidou family has become the headquarters of The Fox Tan company. Kelly and Olivia had now to sort the ‘how’ their product will be marketed and sold. Google has been their friend, both admit with honesty. “There was a lot of googling. We didn’t have any experience in the manufacturing side of things, so we had a lot to learn. And there was also a lot of talking to people, a lot of researching of how we could do this, a lot of trial and error. There are a lot of things that as a consumer you don’t think about when you take that step to create your own business. Just little things, like for example fonts and all the words that are at the back of the bottle. Someone has to write that and there are so many different aspects to business that all has to come together to work. You’ve got your marketing, your production, your manufacturing, your shipping, your customer service, there are so many things, you have to think about. It was just the two of us and we were doing everything,” Kelly admitted. “We really complement each other though because the stuff Kelly does, I would never be able to do so well. I look after new products, product development, the branding, the creative side, I oversee the social media side, all the fun stuff which is easy for me,” points out Olivia. Kelly looks after the logistics, business operations, business development that back end of the business. Their responses confirm that the dynamics of their business and personal relationship are defined by respect for each other and love for what they do. Three years later The Fox Tan is a fully-fledged company with its own warehouse in Mitcham. It supports a 10-member staff in Melbourne and dozens of other people around the globe, distributing their products. To the one and only product they started with, were added another four. “We never came in with expectations. We are so busy to work towards the next goal and we do not have enough time to look back on what we have achieved. We always try to chase the next thing and always working hard,” said Kelly. Their generosity of spirit comes to the fore when I ask them to speak to other young women who are looking to start their own business. “Just get started. There is no right time to do it. Especially in this day and age it is easier than it was. With this online world you’ve got the world just in your palm, in your phone. So there are so many tools out there, and so many ways to do it. Pick an idea, be passionate about it and get started and why not give it a go. You don’t need a lot of outlaying, it is not like it was back in the day where you needed a shop and you needed billboards or magazine advertising, the times have changed,” said Kelly. Olivia, too, believes in having a can-do attitude. “You need a lot of drive and to love your product. You can come up with any idea but make sure it is a great one. Make sure the product works and has great branding. Branding is key as well as a great tone of voice for the company. The hard part is coming up with the idea because there is so much out there and there is so much competition. How you separate yourself from the rest is important” she adds. For you, the reader The Fox Tan story ends here. For Kelly and Olivia though, it continues and the signs of more successes coming their way, are there.